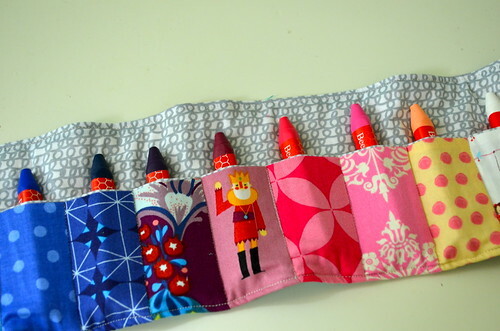 As soon as I splurged for some lovely beeswax crayons, I knew I wanted to make a special crayon roll up for them. So despite the other things I should have been doing last night, it was just time to make this. Obviously, the most time consuming part was picking out the exact fabric to match each crayon hue and then cutting them. I did not use a pattern, but cut my rainbow pieces 2" x 3.5." This may have been a bit on the wide side, as the roll measures a full yard at 36" long. The main fabric piece was cut at 5" x36" with Echino on the front and Ed Emberly scribbles on the back. I still need to get a button as my original idea of just wrapping the hair elastic around the entire roll did not work out because the roll is so gigantic. I have yet to show it to the boys. I am in love with it, but I have a feeling they are not going to be impressed! Oh, well - I wouldn't mind keeping it too much! Wow, I am impressed!!! 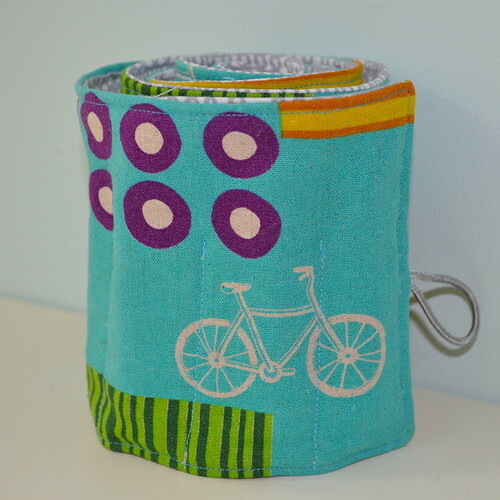 Very cool, I love all of the fabric choices, what a good way to use up scraps! It's fantastic!!! I wouldn't give it to my boys, I would just unroll it and admire it from time to time. It's really beautiful! Adorable! You should sell them on Etsy! U keep it...so wonderful and cute. Cute! What is the grey loopy fabric behind the crayons? I like it! 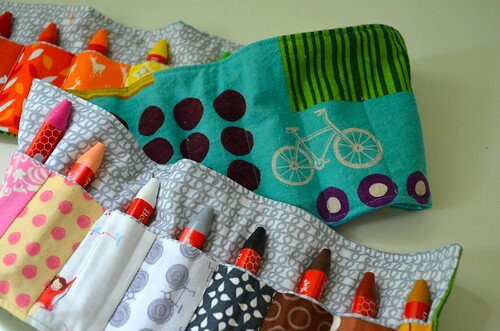 I bet your boys will enjoy the crayon roll. Oh my I just LOVE it Courtney! If they don't love it you should definitely keep it. That last picture would also be a fabulous header for your blog whenever you decide to switch it out. So so cute! How are beeswax crayons in relation to regular crayola? Are they washable?